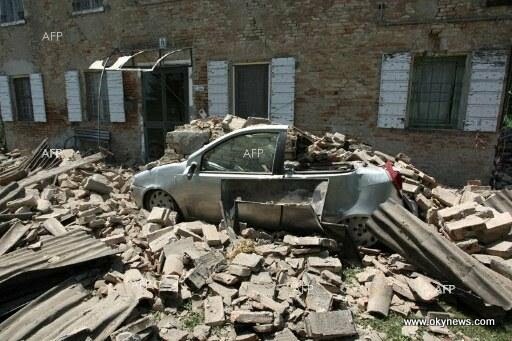 At least 15 people were killed by earthquakes in Italy northeast on Tuesday, and rescuers were searching for missing several times, according to the Civil Protection Agency. "At this point, we have 15 people confirmed dead and four or five people missing," a spokesman for the agency in Rome told AFP. "Everything collapsed, it's chaos, the buildings across the city are down," a firefighter from the city of Cavezzo told Corriere della Sera. The magnitude 5.8 earthquake struck about 60 kilometers east of the city of Parma, according to the Geographical Institute of Modena, and sent panicked residents rushing into the streets. It followed a magnitude 6.0 earthquake in the industrial North, on May 20 that killed six people and left thousands of tents in makeshift accommodation, with many historic buildings and houses reduced to rubble. "Everything was shaking, we ran the streets. The roads are now blocked by people trying to flee the center if there is a replica, "Corriere della Sera journalist Elvira Serra said the small town of Cento. Historic chapels, churches and buildings damaged by the initial earthquake crumbled to the ground as panicked citizens joined those already in camp blue tent camps set up in parks and school playgrounds after the earthquake last. "Last night was the first night we spent back into our homes after the first quake. Then another big hit," said one resident told SKY TG24 television in Sant'Agostino, with buildings with holes gaping in their sides. At least three victims were workers crushed by falling rubble. Three were killed in San Felice del Panaro when a factory collapsed, two others died in the city of Pico della Mirandola, one at Concordia and the other in Finale, police Capt. Salvatore Iannizzotto Modena told ANSA news. 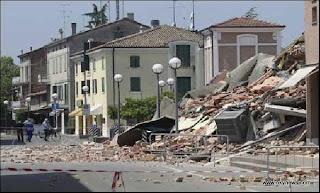 A parish priest in the town of Rovereto di Novi was also found dead, but Iannizzotto said it was unclear if he died of shock or was killed in the earthquake. A woman was killed when Cavezzo in a furniture factory collapsed. Carpi firefighters said the priest, he was killed, ANSA reported. 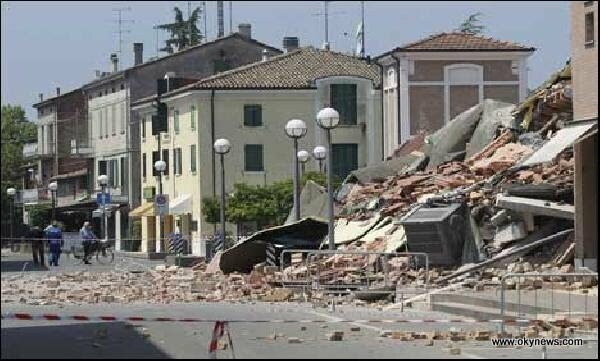 "A new earthquake struck the region Emilia-Romagna, leaving the victims, the wounded and damaged buildings in its wake," the Prime Minister Mario Monti said in a televised speech from Rome. "I send condolences to the government's victims' families and we urge all citizens to have faith. I'm sure we'll have more this time, "he said. "The success of the population will not be abandoned," said the head of the Emilia-Romagna, Vasco Errani. In Pisa, home of the famous Leaning Tower offices were evacuated as a precaution. People were running in the streets of shops and offices in Milan, Bologna and the Aosta Valley, near the French border. In Bologna, where the quake was clearly felt, trains to Milan, Verona and Modena were suspended, the Italian rail network said, while the tests were conducted to determine whether the lines were damaged. There were moments of panic in Venice, where a statue fell to the ground, slightly injuring a bystander. About 7,000 people who fled their homes in the area when the first earthquake struck are still living in tent camps erected in around 89 fields, sports grounds, car parks and schools. The camps can take up to 9000 people. The region was hit by a series of earthquakes and aftershocks over the past two weeks. The latest disaster struck just over three years after an earthquake of magnitude 6.3 devastated the city of L'Aquila in central Italy in March 2009, killing about 300 people and leaving tens of thousands of homeless.